Do Universities Increase Innovation In Their Communities? File this one under “random stuff that came through my Twitter feed today.” It’s a paper from Michael Andrews, a postdoc at Northwestern, and it examines whether universities promote innovation. The methodology is simple, though the work required to gather the data appears to be rather stunning. Basically, Andrews looks at counties that were chosen as sites for public universities (mostly in the 19th century) and examines whether they benefited from a subsquent upsurge in patent activity. The answer turns out to be yes. Consolation prizes are especially common in western states that were largely unsettled and achieved statehood after the passage of the Morrill Act in 1862. In these states, typically many state institutions were allocated at the same time, including the state capital, the state prison, the state hospital, or the state insane asylum. While numerous localities may have been lobbying to get a state institution, which locality ended up with which institution was as good as random. For one famous example, the Tucson delegation set out for Prescott for the Arizona territorial legislature in 1885 intent on getting the state mental hospital. But flooding on the Salt River delayed the delegation. By the time they reached Prescott, the mental hospital had already been spoken for; Tucson was stuck with state university. Table 13 shows results that explicitly consider the consolation prize counties. 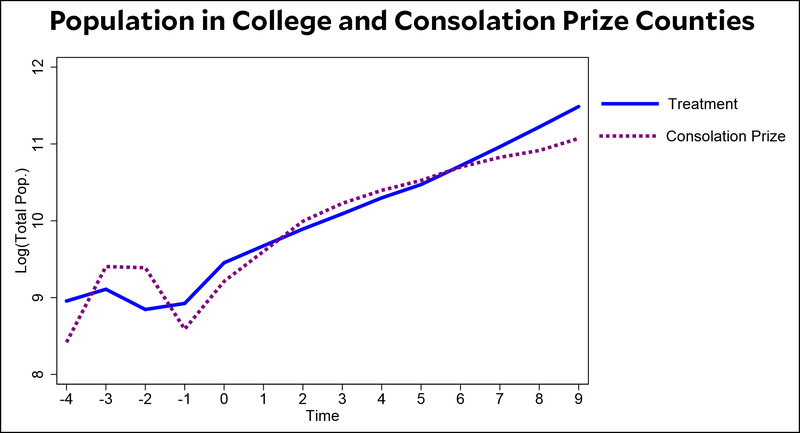 In column 1, I compare patenting in the college counties to consolation prize counties. The coefficient is a statistically insignificant 16%, smaller than the baseline estimate of 32%. This suggests that college counties do not increase their patenting much faster than counties that received prisons, hospitals, or insane asylums. Obviously universities do have an impact on innovation, but apparently it’s diffused all over the country as students graduate and move away. What’s left is usually a nice, bustling town, but not a hub of innovative activity.